October was upon us; Autumn started very slowly and the weather remained warm for the first two weeks of the month. It wasn't until the third week that the weather really broke and the first Atlantic depressions started to blow in across the country. This is the time of year when the urge to hibernate grows day by day. Jane had the wonderful experience of selling one of her paintings hanging in the Small Plaice Gallery, see the links page for New Modern Masters web site. This was the first time she has ever sold a work of art but it certainly wont be the last. 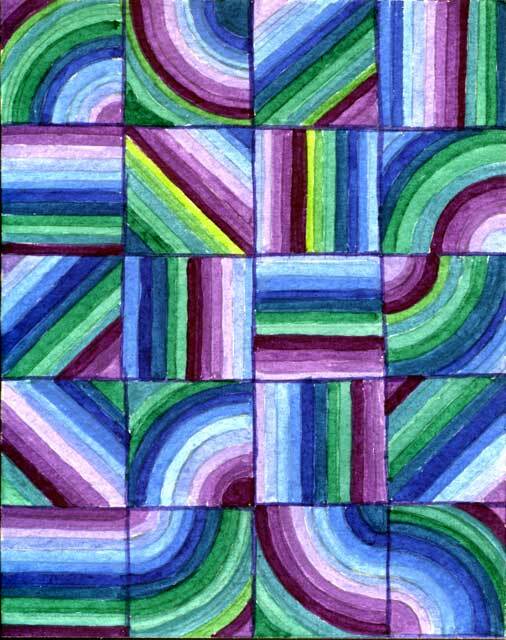 She is now producing some very interesting paintings with a unique style which is developing as each one is produced. This one is one of her favourite examples but there are others in production which are sure to take the top place before too long. 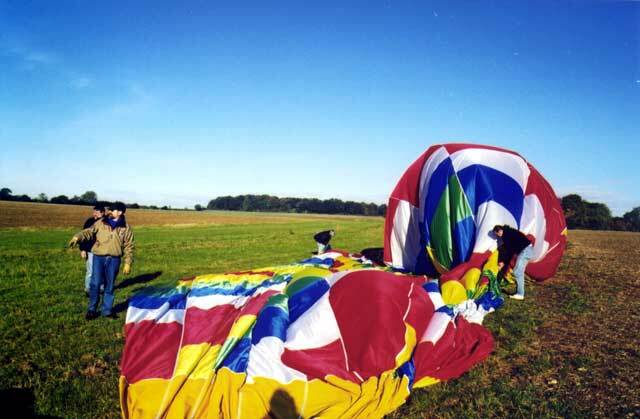 Steve managed to finish the development he was doing on the Ballooning Business' web site. This can now be seen at www.ballooningbusiness.co.uk. He started on this in February this year but lost the impetus during the summer. Now its "finished" he's looking at ways of extending his web development skills. We went to see Signs starring Mel Gibson in the first part of the month. Another aspect of Jane working part time is that Steve can get home from work early and get to the cinema before 6 pm when it is at a cheaper rate. The film was Sci Fi and kept us entertained even if the ending was predictable. The crop circle signs were very good but it was a film that would be just as good on video at home. Steve had his birthday around the middle of the month and was fortunate enough to strike lucky with the weather. He flew Jane and Val in CZAG on the Saturday morning. It was their first flight in CZAG, and what a flight. The morning light and sharp frost gave a very spectacular atmosphere. Jane took some wonderful shots full of autumn colours and early morning long shadows with frost still on the ground. 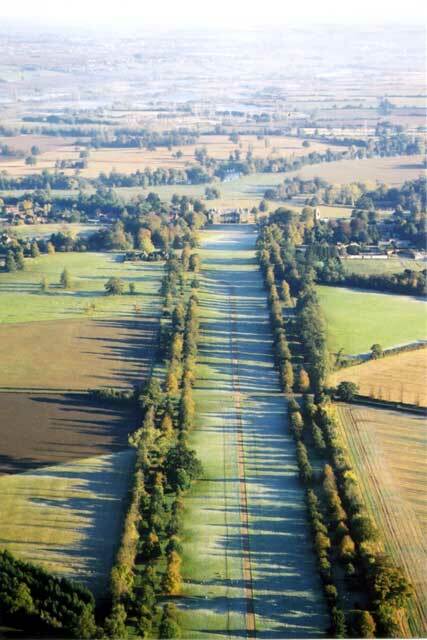 This is a picture looking up the drive towards Castle Ashby in the distance. At this time of year the animals are still in the fields and although the harvest is over these days the farmers are under-sowing the stubble straight away so there are very few places to land. Patience pays off and after 1 hour 10 minutes we came across some grass between two sown fields. The ditch between the fields acted as a brake and so we managed to stop before dragging onto the newly sown crop. There were no farmer problems and we were packed away and on the road home within thirty minutes. For the first time in two years we held one of our infamous camp fire nights. Steve digs a whole in the yard for the fire. The idea is to cook sausages, burger and beans over an open fire, in true boy scout style. We do bake the potatoes in the oven which is cheating a little but otherwise we would be waiting all night for them to cook. 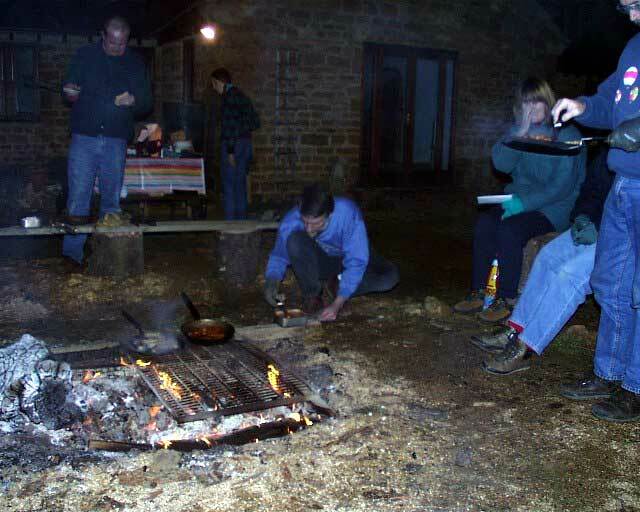 The photo on the right was taken at the campfire in 1998 and this area is now laid to lawn with a high stone wall between this part and the drive. 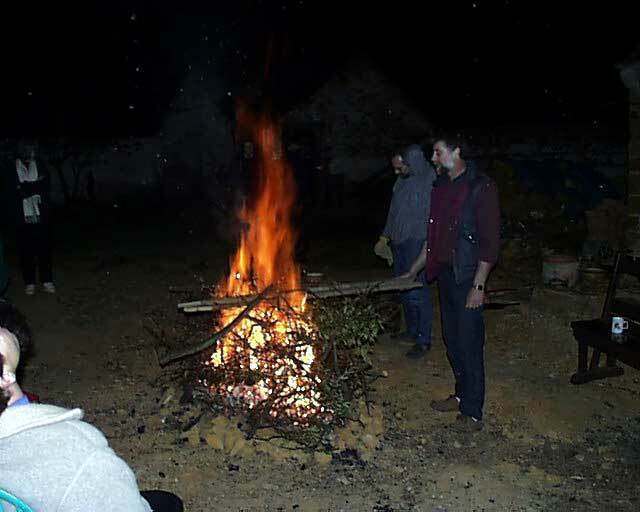 These events are always smoky and possibly take us back to some primeval time when fires glowed in caves or simple shelters and burnt food was the order of the day. Having missed last year we thought there would be no demand for another but it seems our friends enjoy these evenings which makes it all worthwhile. Jane is an ardent fan of Anthony Hopkins so we had to see Red Dragon which is the prequel to Silence of the Lambs. The story was made into a film, Man Hunt, about 15 years ago and although Jane couldn't remember it Steve was interested in the way they had updated it and given Hannibal Lector a more significant part to play. The last Sunday of the month was really exciting because we experienced winds of over 70 mph. Several trees between us and the next village were brought down so we were on the road with the chain saw cutting up as much wood as we could; stocking up the winter fuel. This is a double win because you get warm cutting the wood and then warm again when its burnt on the log fire. We're still contemplating changing the Terrano but our approach to the local Land Rover dealer hasn't produced any help with buying a Freelander so we are now looking at a Nissan X-Trail. 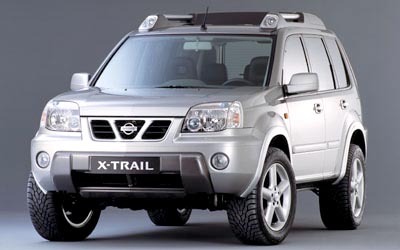 The Nissan will no doubt be more reliable, it is cheaper to buy and has the same mpg as the Freelander.